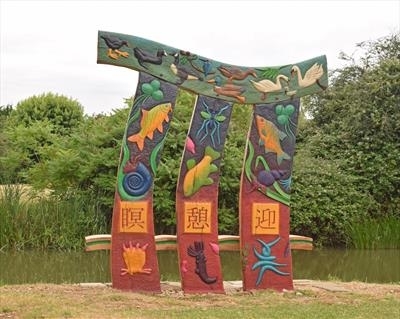 Situated by the Grand Union Canal, Milton Keynes, The bench structure echoes the curves of Japanese Temple grooves and the relief carvings refer to the common wildlife of the canal including the micro-life present underwater - the larvae, floral algae, the hydra, and amoebae. The Japanese characters read, from right to left,"Welcome, Relax, Contemplate". This is the view of the back of the bench. I was commissioned to build this Three Post Bench by Great Linford Parish Council, Milton Keynes. It is one of several artworks adorning the recently opened Gyosei Art Trail. The Trail is named after the Gyosei Japanese International School, now demolished, and the developers of the site have provided the funding for the commissioned works.